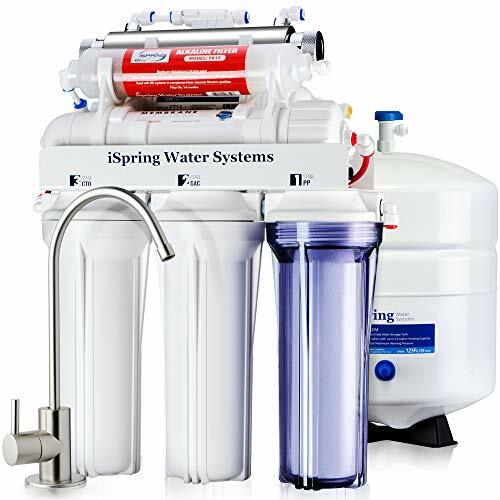 The iSpring RCC7AK-UV is a very good reverse osmosis water filtering system, capable of eliminating most of the usual debris, chemicals, microorganisms, and bacteria from your water source. In the following article, we take a closer look at how this water filter works, which are its pros and cons, and how efficient the unit actually is. This RO filter is small enough to fit in a standard kitchen counter cabinet, and it’s fairly easy to install. The unit comes with written instructions, but you can also check out video tutorials or contact their customer service for a professional guidance. Besides, all the lines are color coded, and the instructions will guide you step-by-step through the installation process. The system has a 1-year limited warranty and a lifetime technical support. This model comes with a complete filter pack. You will benefit from an alkaline pH filter, which will remineralize the water making it better tasting and healthier, and from a UV light as well. The UV light is great for killing bacteria, viruses, and other microorganisms usually found in a water source. Besides the filtering system, you will also receive a faucet when you buy a unit. The faucet has a solid brass construction and a brushed nickel finish, making it very durable. The faucet has an elegant U design and it will make a great addition to every kitchen, either with a classical or a modern design. The iSpring RCC7AK-UV has an efficiency ratio of 2:1. This means that 2 gallons of wastewater will be produced for every gallon of fresh water. This is a very efficient unit. Some RO filtering systems can produce up to 20 gallons of wastewater for a gallon of pure water, and it’s usually considered that filtering systems with a ratio smaller or equal to 4:1 is efficient. Using an efficient unit is not only cheaper in the long run, but it’s also better for the environment since less water is wasted. High-quality filters are somewhat of a specialty for iSpring, so this model benefits from the best they have to provide. The filters are guaranteed to remove up to 99% of all the debris, bacteria, viruses, and chemicals from your water source. The filters are very efficient in removing everything foul from the water, but you have to change them periodically. Most people should replace the filters once every six months to a year, depending on the quality of their water source. In addition to the standard filtration most reverse osmosis systems use, this model also uses a carbonite filter for water remineralization and a red mineral filter which will add ionized minerals to your water source. Both filters are actually two separate sections of the sixth filtering step. This will make the water healthier and better tasting. The UV light is capable of killing viruses, bacteria, and other microorganisms from your water source, so it will provide a better water quality. This makes the iSpring RCC7AK-UV better suited for well water than other RO filtering systems. The UVB light is automatically turned on when the water flow is running, and it will turn off a few seconds after the water is turned off, making sure that the water which already entered the installation is germ-free. The installation process is fairly easy and straightforward. Many people who have previous experience with DIY projects will be able to install the unit in under one hour. If you don’t have previous experience, don’t worry. You will still be able to install the unit by yourself. All you need to do is follow the instructions manual which will explain the installation process step-by-step. However, the instructions manual is poorly written, and some people might have problems following it. There are many helpful tutorials online you can watch if you have problems following the written instructions. If you’re stuck at some point during the installation, call iSpring’s customer service. Their experts will guide you through the remainder of the installation. Some customers complained that the 1/4” tubes that came with the unit were damaged, so make sure you check them for nicks and scores before you start the installation. If your tubes are damaged, replace them. UV Filter – The UV filter is very good at killing bacteria, viruses, and other microorganisms commonly found in your drinking water. This is a great way to filter the water, especially if you have children in your household. 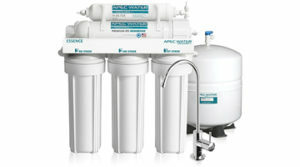 Good Remineralization Filter – This RO system uses a special filter to remineralize and alkalize the water. This will improve the water’s taste, and it will also make it healthier. Poor Installation Instructions – The written installation instructions are very confusing. Even the grammar they use is bad. Most people will have some problems following the instructions. Thankfully, there are video tutorials online you can follow. The customer service experts will also help.